The Life and Times of Jesus. All the stories from the LIFE OF JESUS in one set: Jesus' birth in a manger to His resurrection. Listen to reenactments of Jesus' birth to His miracles and parables. Follow the brilliant angel-star with wise men from the east to Baby Jesus SAVED! from King Herod's death decree! Walk on the watery waves with Jesus as the fearful disciples are SAVED from sinking! Share the astonishment of Mary and Martha as resurrected Lazarus is RECLAIMED! from death and the tomb! Marvel how impetuous Peter was RECLAIMED from his guilt and found peace. And listen to the story of Jesus who died on the cross so that all can be saved. 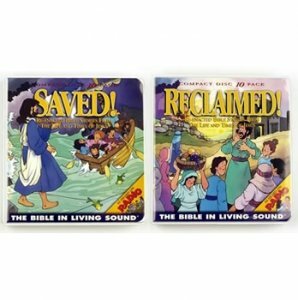 THE BIBLE IN LIVING SOUND's audio dramatizations are reenacted events in the Bible that captivate listeners of all ages as they visualize and learn the values taught in God's Word! Listen to the Bible ... in living sound! Listen to the dramatized Bible stories from Baby Jesus to Jesus' death on the cross in SAVED! and RECLAIMED! Use Exploring God's Book 3 workbook as a Bible study guide for personal study, church, Sunday School and home school curriculum for SAVED! Volume 5 and RECLAIMED! Volume 6. 242. "Thou Shalt Call His Name Jesus"
299. Who Is the Greatest? 336. "I Am the Vine"
352. "The Lord Is Risen!" 359. "Go, Teach All Nations"